The curves are virtually identical. 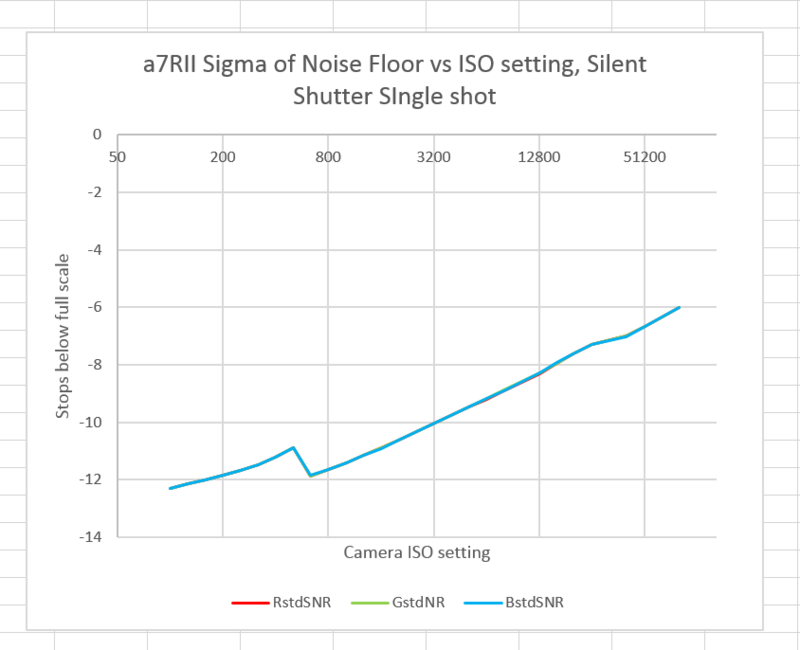 Silent shutter does indeed increase read noise. 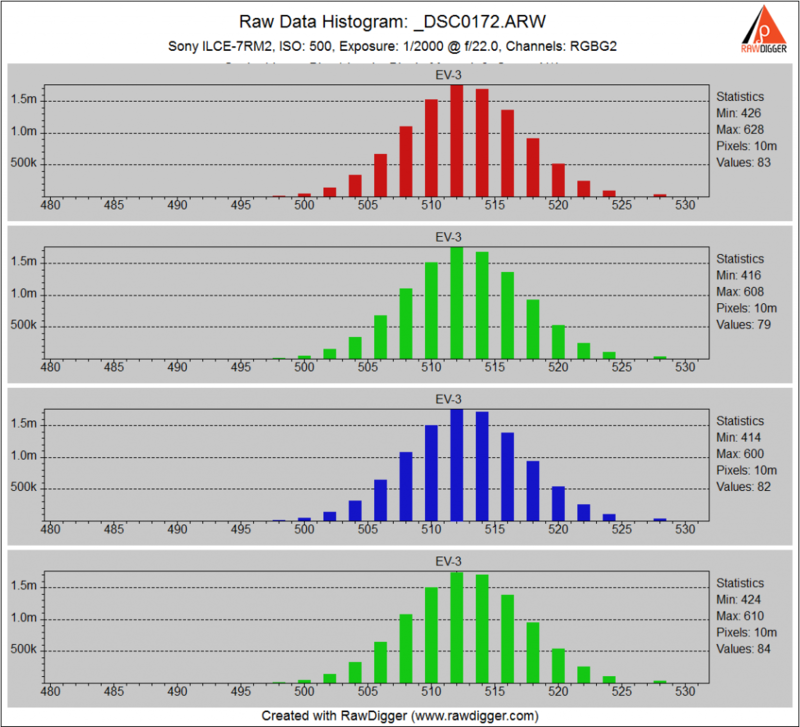 We can see what’s going on with the precision by looking at some histograms. Every other bit bucket is depopulated, meaning that there are thirteen bits of precision. Only a quarter of the buckets are occupied, meaning that there are twelve bits of precision. Not only that, the noise level is higher. Looking at continuous mode, we see something similar, but the noise levels are better, as shown by the curves. 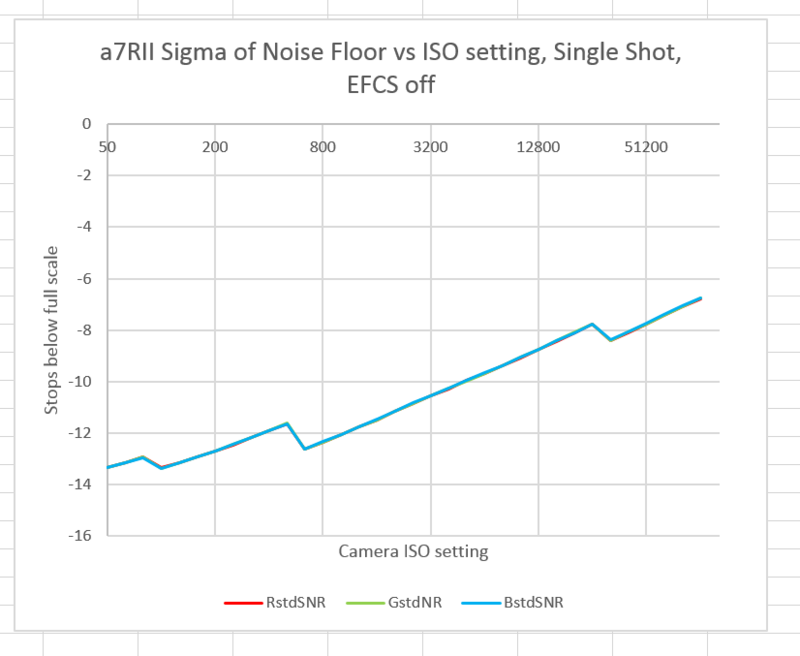 Very interesting that electronic shutter and continuous shooting has differing resolution. Do you know what the sensor read speed is for the electronic shutter mode? I need silent shooting for my photographic work on film sets, so readout speed is a key feature (and I can’t find the information anywhere). I know you have done tests with other cameras, so any help would be great. I would expect about the same for the a7RII, but I haven’t tested it. I could end up being surprised. Thank you for doing the tests and showing the results so clearly. I’m mystified. Why would Sony let this happen ? Assuming its not an intentional design “feature” why would they leave this hardware bug/problem in a production camera ? What do you think could be causing it ? I don’t consider any of this behavior to be the result of an error. I beleive the camera works as designed for what I’m reporting here. I think there are probably speed/cost tradeoffs at the root of all these little quirks, except for the bulb mode spatial filtering and bit-depth loss, which, frankly, mystifies me. In experimenting with silent shutter in my A7R2 last night, I got striped artifacting in artificial light. My guess is the sensor read was out of phase with the lighting (incandescent – so it probably had to do with the ac current), and it led to these ugly lines in my photos. As an engineer, what do you think? That’s typical with a 1/30 second scan time, which is probably what the a7RII does (I have yet to test it). I’m surprised that you saw it with incandescent lights; usually the thermal time constant of the filament is long enough to prevent this. See the sample image I linked to. They were incandescent, which leads me to think it may have had something to do with the current cycling. Current cycling? I don’t understand. Sorry. I’m not an engineer. But with alternating current, the electricity cycles, right? And wouldn’t this cycling manifest itself by imperceptible on/off cycles that might be picked up by a sensor taking samples not in phase with these cycles? Like I said, I’m no engineer, so I may be way off here. 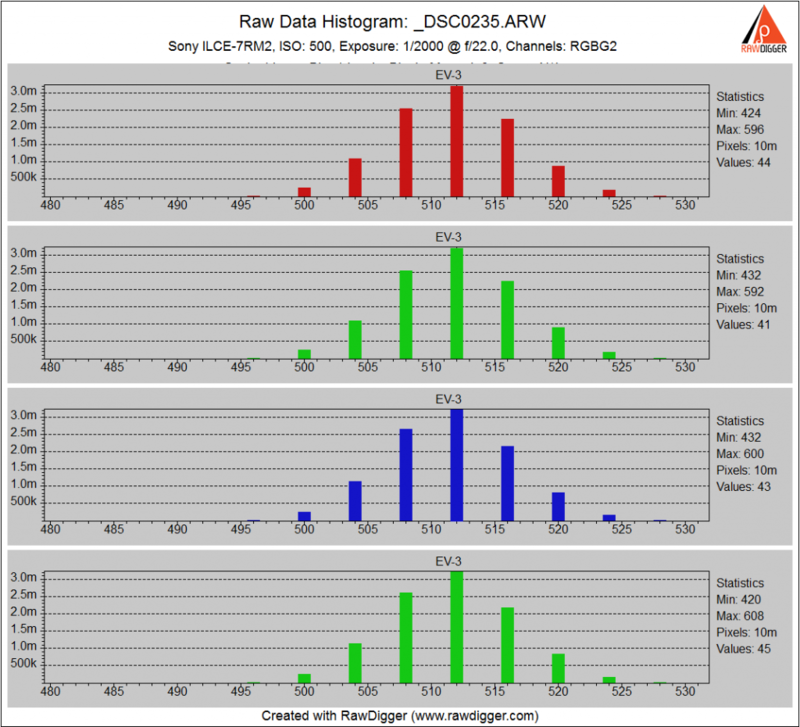 Th ac cycles at 50 or 60 Hz. 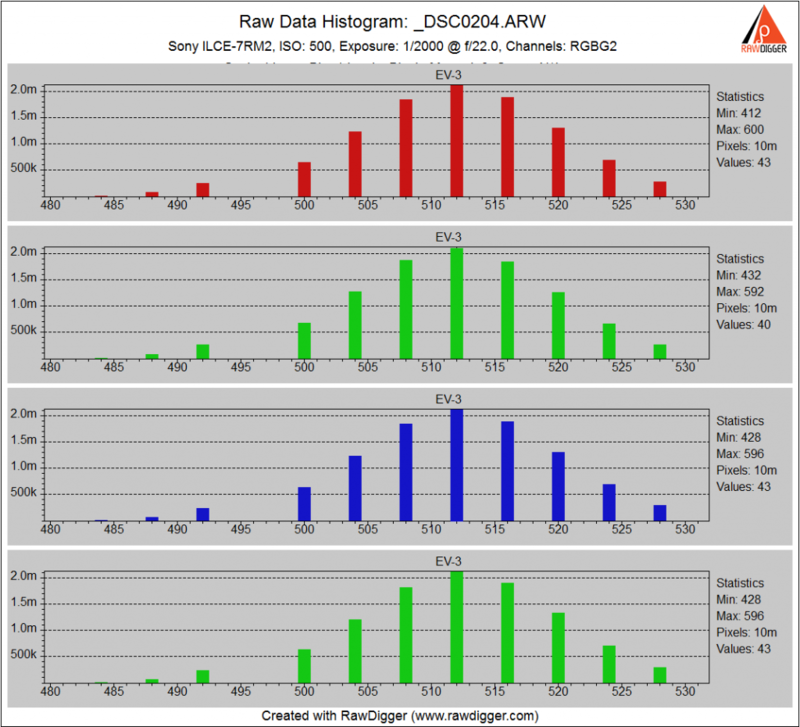 So most lights are modulated at 100 or 120 Hz. The bands appear to be faster than that. Here’s the specific photo. After I turned off silent shutter, the effect disappeared. I count at least ten bands from top to bottom. That’s too fast for ac mains fluctuations, unless the travel time is a lot slower than I think it is. Do you have another theory? So, if the light is 100hz and there are 10 bands then the sensor scan speed is roughly 10/100 or 1/10 of a second. You can occasionally get this kind of flicker effect on cinema camera as they are shooting at shutter speeds slower than the frequency of the lights ie. 1/24. Its something I have looked into as I need a silent camera to work on film sets (I am an on set photographer) that also has a good sensor scan speed that avoids stretching or jello effects on moving objects or when I move the camera. The a7s was a big deal as it was a 1/30 second scan time which was pretty good – just the resolution is too low for some of my clients. I did use a fuji x-t1 in electronic shutter mode, but it had issues with movement as it had a 1/15 scan time. Been playing with a Nikon 1 v2 which scans at a speed of 1/60 which seems to eliminate these problems in almost all circumstances – but its at a price as it is only a 1″ sensor. 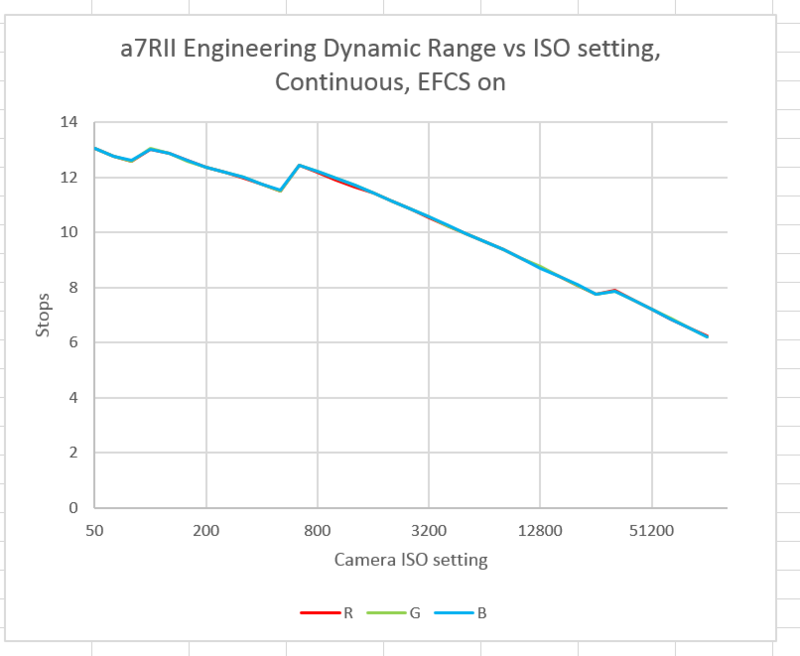 I was hoping that the a7r ii would be the camera for me, but it looks like the scan time is longer in order to be able to scan the 42mp sensor – not surprising, but too bad. So, I think that is why – but feel free to correct me! So, if the light is 100hz and there are 10 bands then the sensor scan speed is roughly 10/100 or 1/10 of a second. Thank you, thank you, thank you for running a further test! This is very helpful to know. 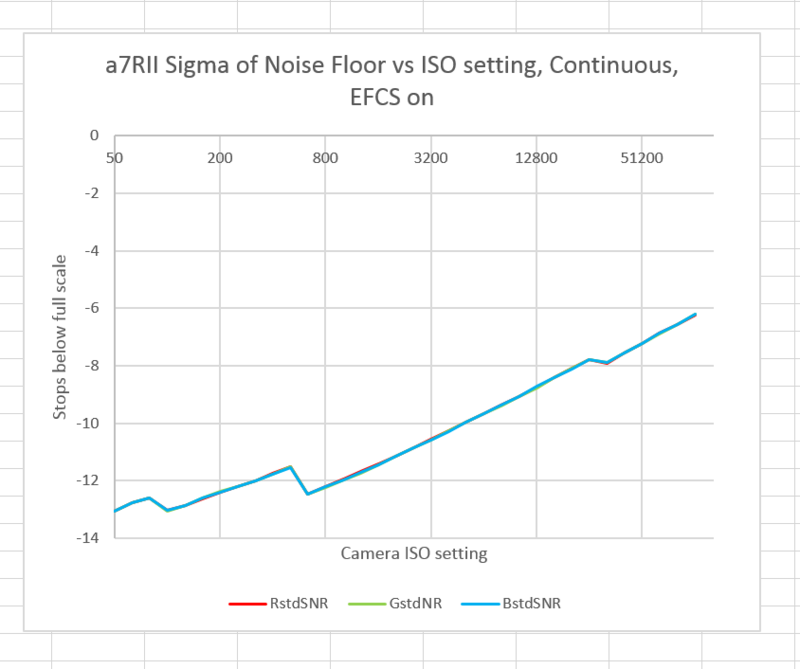 I guess I will wait patiently for the sensor scan performance of the eventual A7s ii and give the A7r ii a pass for silent shooting during my film industry work – can’t quite ditch the sound proof housings yet! Amazing. I had no idea those existed. Could be operating in PWM dimming mode. The risetime of the LED itself is nanoseconds but the phosphors have a exponential decay, this matches with the stripes having a bright edge and then fading as you go down. http://apps1.eere.energy.gov/buildings/publications/pdfs/ssl/poplawski_dimming_lightfair2012.pdf has some waveforms of LED dimming. Can be quite complicated. Oh, my. Thanks for that. So it might actually be 150-200 hz bulb (or more?) – so the scan speed is closer to 1/15 or 1/20th? 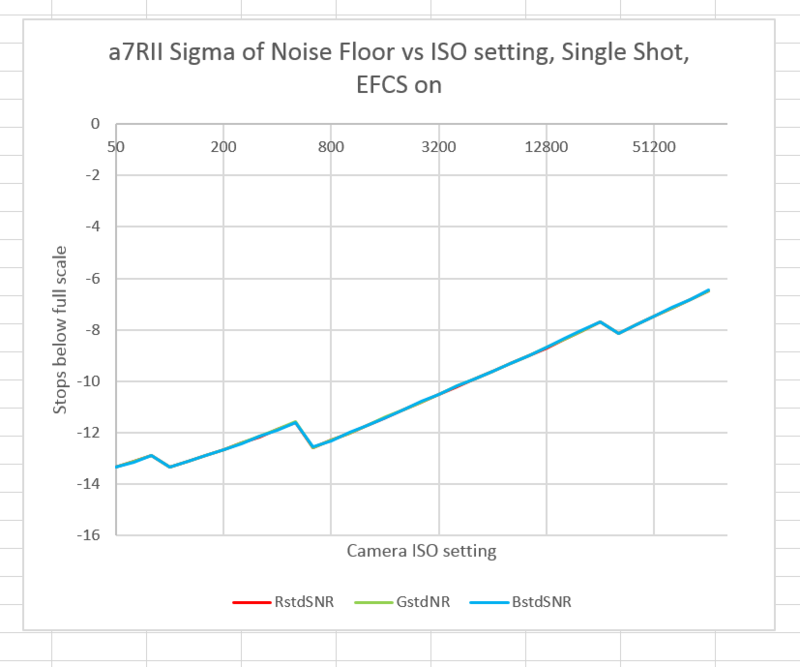 Man, I was just starting to be happy with my decision not to have to buy the camera – if its some crazy high hz bulb then I am now still confused!